धन्यवाद!!! 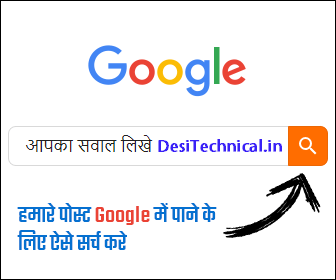 Hello, Friends All You are Welcome in Your Blog named as "Desi Technical".At your own Desi Technical Blog where we will review the latest technology news, tech knowledge, tech products for you, and increase your tech knowledge. In this channel, i have posted all Videos related to Technology which are on "Trending" that create "Most Confusion" and Also related to Education or this Blog help you to grow in your Studies Friends !! Please Subscribe Friends We Need Our Support To grow "Jai Hind Bande Mataram". THANK YOU!! !